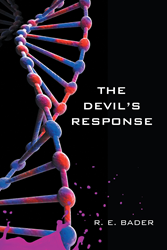 Recent release “The Devil’s Response” from Page Publishing author R.E Bader is the story of Gwen and Caleb, a couple who utilize their skill-set in bio-chemistry to conceive children. What appears to be a promising future, based on a carefully constructed decision made by the couple, becomes a much more complicated reality. Author R.E Bader, has completed her new book “The Devil’s Response”: a gripping and futuristic glance at the inevitable choices that must be made when confronting technology. Gwen and Caleb, an academic couple, embark on a journey to conceive children, and forever alter their fate. Published by New York City-based Page Publishing, R.E Bader’s compelling and cautionary tale of one couple’s decision to conceive children through unorthodox means. Timely and thought-provoking, “The Devil’s Response” explores the notion of tampering with nature and the repercussions of such actions in the long-run. Readers who wish to experience this riveting work can purchase “The Devil’s Response” at bookstores everywhere, or online at the Apple iTunes store, Amazon, Kobo, Google Play or Barnes and Noble.